LOCAL PRODUCERS JOIN FAIRTRADERS FROM AROUND THE WORLD at the Jericho community centre with shawls, jumpers, hats, gloves and scarves from Peru and Bolivia, silk scarves and pashminas from Bangladesh and India, jewellery from Africa coffee from Nicaragua, organic fresh vegetables from Oxfordshire. Fairly traded or local and organic goods from far and near will be on sale on Saturday 18 th December at the Jericho Community Centre, 33a Canal Street from 2 noon until 5 pm. 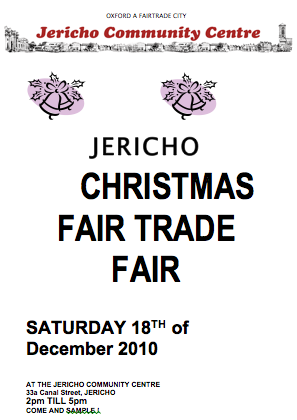 This is the seventh year running that we have organised a Fair Trade, Local and Organic Christmas Fair. Last year it was a great success, attracting lots of people from all over Oxford. There will be a raffle with the chance to win some organic produce and many other surprise prizes, with the proceeds being donated to the Gatehouse, a local charity that provides hot soup, sandwiches, tea and coffee to homeless people over the winter months. You can find a poster to download to help promote the event here.